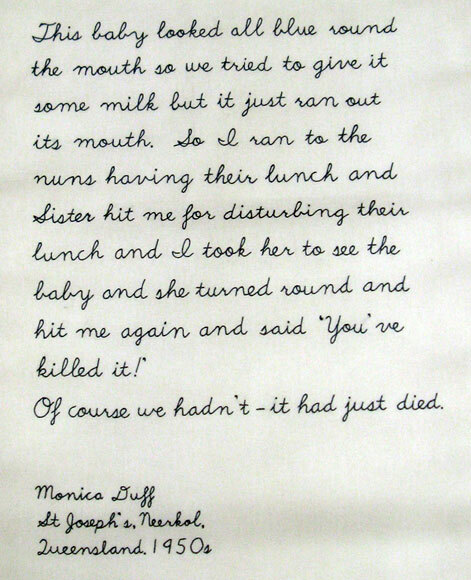 The Exhibtion designers took the many stories that had been collected and set about working out how they could be displayed for the exhibition…They envisioned one story written on a cot sheet, they found an old metal hospital cot, chose cursive script and I was recommended to them for the job of embroidering the story onto the sheet. First task was to find a white cotton sheet that could be embroidered, most sheets are so tightly woven that I would not have been able to push the needle through them, my fingers where saved by a friend who had a much worn, soft cotton sheet that was lovely to work on. I embroidered the cursive script with stem stitch using 3 strands of DMC in an old blue ink colour. When the embroidered sheet was put into the cot it made for a very poignant display. Hi Annie, I just popped in to collect your Crazy patch instruction link to pass on and checked the blog as well. What a fantastic thing to have embroidered script onto cotton. such a big endeavour and a wonderful story of hard times. I was fortunate to have fabulous nuns teaching and treating the pupils well in the early 50’s. Oh my gosh, so sad!!! !